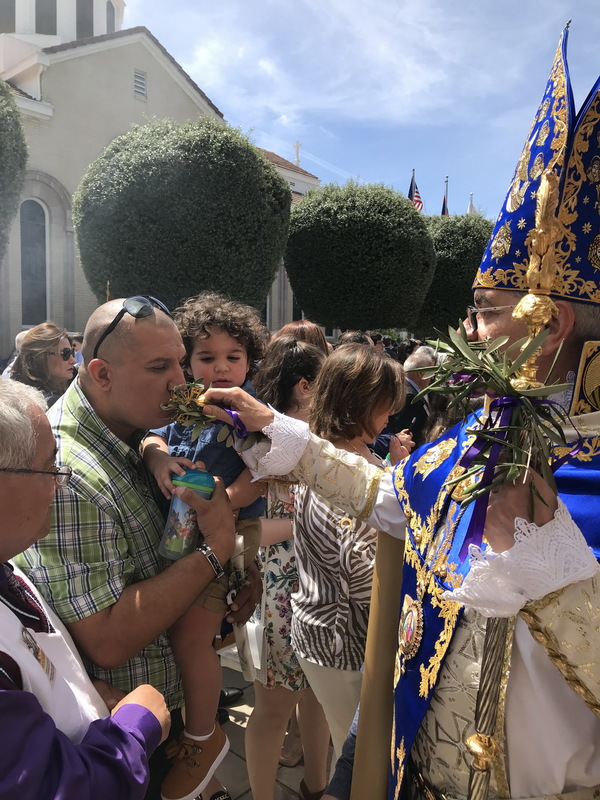 On Sunday, April 14, 2019, Prelacy Churches, beautifully adorned with palm fronds, were brimming with faithful and children who had gathered to celebrate the triumphant entry of our Lord Jesus Christ into Jerusalem. H.E. 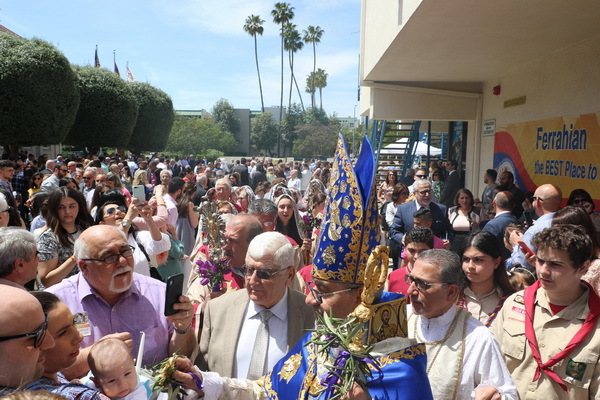 Archbishop Moushegh Mardirossian, Prelate, celebrated Palm Sunday Divine Liturgy at Holy Martyrs Church in Encino, delivered his message, blessed the faithful and the children in particular during the children’s procession, and conducted the Opening of the Doors ceremony. Archpriest Fr. Razmig Khatchadourian assisted at the altar. Among the faithful in attendance was Homenetmen Central Executive Chair and National Representative Assembly Chair of the Lebanon Prelacy Karnig Mgrditchian. The Prelate prefaced his sermon with the account of Jesus’ entry into Jerusalem, His raising of Lazarus and miraculous healings, word of which had reached the people, and thus, the joyfulness of the crowds that greeted Him, spreading their clothes on the ground and waving branches with jubilant exclamations of “Hosanna to the Son of David! ‘Blessed is He who comes in the name of the Lord!’ Hosanna in the highest!” His Eminence noted that this time, however, Jesus arrived with a different message and under different circumstances, to reveal Himself as the promised Messiah and the Lamb of God. 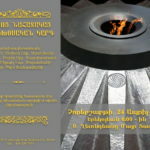 On that day were three types of people who greeted Him; those who heard His Word and obeyed it, those who heard His Word but did not really comprehend its meaning, and those who refused to hear Him and His message, said His Eminence, asking which group we consider ourselves a part of. “Palm Sunday invites us to sing praises to the Lord as we accept Jesus Christ as our Lord and Savior. 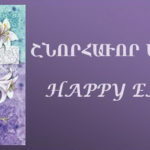 The Armenian people centuries ago grasped the Lord’s salvific message. Do we have that same faith today? With heart and soul, with noble and pure hearts, with gleeful and serene spirits let us accept Him today as our Messiah. Second, Palm Sunday invites us to perceive Jesus’ triumphant entry into Jerusalem with our spiritual eyes and welcome His entry into our own personal Jerusalem, our hearts, by surrendering to His will, rather than ours. In today’s world, people impose their will unto others motivated by self-interest, rather than carrying out God’s will for love, peace, and justice. Let us welcome Him into our hearts, so that He will enter into our collective life as well, into our church and national life. Finally, Palm Sunday invites us to service and sacrifice, to become His servants and submit to Him and His will. Jesus entered Jerusalem knowing that just days later He would shed His innocent blood on the Cross. He entered not as a King Who would conquer the Roman authorities, rather as the King Who would conquer death by death. He entered not as a military leader, but as a lowly servant, to bring us the good news of salvation through the Cross and the empty tomb,” said the Prelate, and concluded by inviting the faithful to partake in Holy Week services with faith and awe, to welcome the glorious Resurrection of our Lord with a fervent and triumphant spirit. 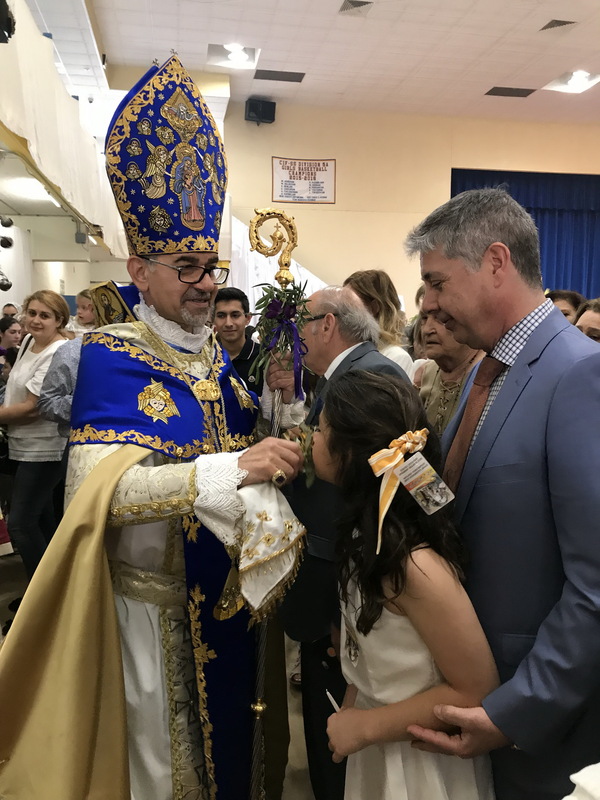 At the conclusion of Divine Liturgy, children led the Prelate in a procession comprised of deacons, altar servers, Sunday School students, and choir members, as he blessed the multitude of faithful and young faithful especially. He then proceeded to the Opening of the Doors ceremony, beseeching the Lord to open for us the doors of His salvation. Sevag Manoukian, son of Nigol and Dr. Lynn Manoukian, served as godfather. 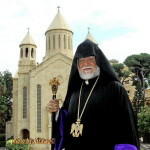 At the end, the Prelate blessed the godfather and, through him, all the children, and urged the parents and grandparents to instruct our youth in the ways of our faith, to plant God’s Word in their hearts and minds, for as we read in the Proverbs, the fear of the Lord is beginning of knowledge and wisdom.